This is a Header Promo Card from the 1999 World Cup Championship Series. It was made by ROOX Sports who are no longer in business. 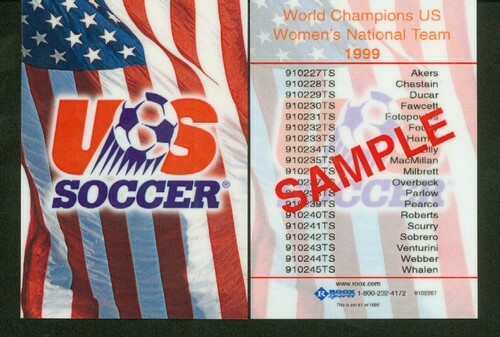 Olympic Trading Cards is the only company that offers this unique piece of Women's Soccer Memoribila. You won't find these anywhere. If you're a soccer collector Womens World Cup or Olympics, this would be a great addition to your collection. These header cards were used to show the quality of the product to certain vendors and investors. The general public has never had their hands on them until now!! You won't find these anywhere!!! Perfect for the soccer collector! !